CLEVELAND, Tenn. -- U.S. Highway 64 through the Ocoee Gorge will be closed for a week, maybe more, after a series of rock slides crashed across the highway Tuesday. Julie Oaks, Tennessee Department of Transportation spokeswoman, said geologists haven't yet been able to assess conditions in the slide area, which is just across U.S. 64 from the westernmost rafting put-in and just east of TVA's Ocoee No. 2 dam. "The problem is it is still raining and there is concern about the stability of the slope," she said. "We will have to wait until the rain subsides before we can get in there to make an assessment." Discussion of a possible rock slide on U.S. 64 came up two weeks ago during a meeting of the Citizens Resource Team, created to make recommendations on Corridor K -- a safer, four-lane route that would replace the current two-lane road. "We are one rock slide away from being isolated," Keith Dilbeck, a member of the Citizens Resource Team, said then. On Tuesday, Mr. Dilbeck, of Ducktown, was among the commuters whose trips to Cleveland, Chattanooga and beyond were rerouted before dawn by the Polk County Emergency Management Agency. TDOT's recommended detour route from Chattanooga and Cleveland toward the Copper Basin or McCaysville, Ga., is north on I-75 to Exit 60 at Sweetwater, then south on State Route 68 to Ducktown. From North Carolina, take U.S. 74 to Ducktown and go north on SR 68. Traffic is being rerouted along State Route 68 through Tellico Plains and Sweetwater, Tenn. The detour more than doubles the trip time between Copperhill and Cleveland. A motorist discovered the first slide about 5:30 a.m. Tuesday, said Don Longworth, operations chief for West Polk Fire and Rescue. "It's pretty common to get rocks coming down, but it's the size and magnitude of this one," Mr. Longworth said. "We had one three or four years ago that shut it down for, I guess, about a month." Crews pushed enough rock aside early Tuesday to allow emergency vehicles through, then set to work clearing the car-sized boulders. About 1 p.m., when only a couple of rocks were left, the mountain rumbled and slipped again, re-covering the highway and pushing full-sized pine trees over the side of the Ocoee gorge. Steve Jones, Polk County maintenance supervisor, said all local workers can do for now is wait. "We are just waiting to see what the ones with the right words can say; the ones with more geology knowledge than I have," he said. Ms. Oaks said the assessment and subsequent cleanup could take a week or more. 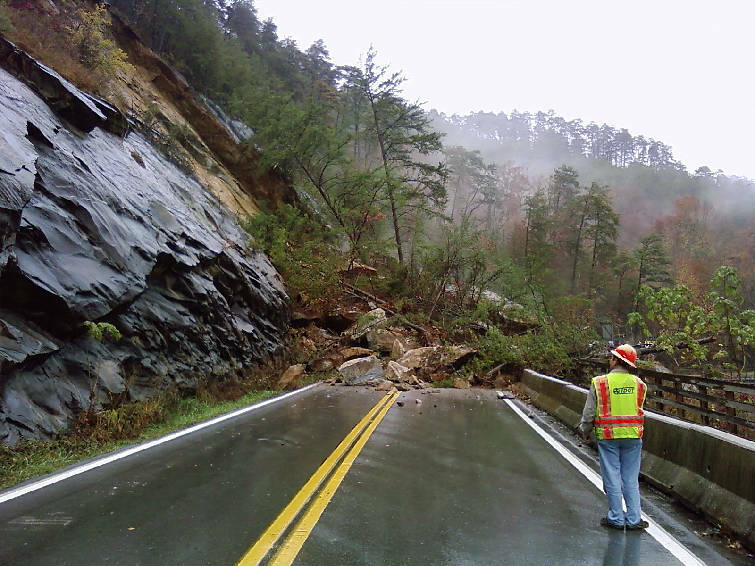 She said TDOT works each year to mitigate rock slides on U.S. 64. "Unfortunately, that is not always foolproof and Mother Nature has a mind of her own," she said.